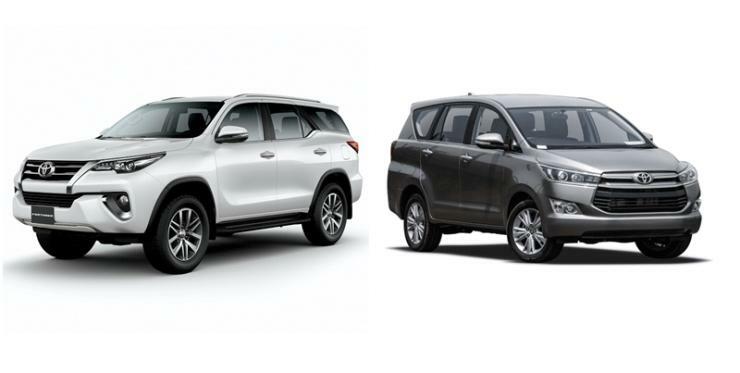 Toyota Innova Crysta MPV & Fortuner SUV break sales records! Toyota Kirloskar India has managed to sell a whopping 97,000 units of the Innova Crysta MPV and the Fortuner luxury SUV during 2017. This is the maximum number of IMV platform (the platform used by the Innova and Fortuner) vehicle that the Japanese automaker has sold in a year in the Indian market. Both the MPV and luxury SUV have been massive successes and sales continue to be brisk more than a year after launch. Both vehicles command waiting periods that run to about 2 months in case of specific variants. Needless to say, both vehicles are segment leaders in sales. The Innova Crysta sold in India is available in 7 and 8 seat variants. In its second generation for the Indian market, the MPV continues to use a ladder frame and rear wheel drive layout. It has become larger in size both on the outside and on the inside. The larger dimensions have made it roomier for passengers. Toyota has added a range of luxury features to this MPV. Three engines are on offer – for the first time in the Innova range. The 2.7 liter 4 cylinder petrol engine produces 164 Bhp-245 Nm, and gets a speed manual gearbox as standard and a 6 speed automatic as an option. The 2.4 liter turbo diesel engine produces 148 Bhp-343 Nm, and gets 6 speed manual gearbox as standard. The top-end 2.8 liter turbocharged diesel engine makes 172 Bhp-360 Nm, and gets a 6 speed automatic gearbox as standard. The Innova Crysta is available in 18 variants, with prices starting from Rs. 13.86 lakhs, going all the way up to Rs. 22.15 lakhs. The Fortuner shares its platform, 2.7 liter petrol and 2.8 liter engines and transmissions with the Innova, but also gets a four wheel drive transfer case, unlike the rear-wheel driven MPV. The new Fortuner has a totally different design on the outside, and looks much more modern. It also has updated interiors, and is less bouncy than before. Toyota has also boosted braking on the new SUV. Loaded with many luxury features, the Fortuner starts from Rs. 25.71 lakhs, going up to Rs. 31.18 lakhs. It’s sold in 7 variants.